Similarities between the modern Irish and German languages raise the question of the origins of these. There are Celtic names and place-names in France, Germany and farther east. Gaelic folklore, too, deals with events on the European mainland. Such evidence indicates that important cultural influences in Ireland came originally from an historic homeland, shared with other peoples to the north and east of the Alps. When tribes broke away from the great Indo-European family, the language(s) they spoke gradually differentiated. In the West, Celtic, Teutonic (Germanic), Slavonic, and classical Latin and Greek subgroups were formed. In the East, there was the Indo-Iranian subgroup which comprised Zend, spoken in Iran, and the related Sanskrit, from which modern Hindi derives. Smaller migrations always occurred against the general trend. As recorded in Indian scripts from the 7th and 8th centuries an Indo-European people, the Tocharians, went as far as the Tarim Basin in China. Archaeological discoveries have shown that these people had red hair: the mark of the Celt. Within subgroups, languages which have developed separately over some hundreds of years - sister languages - are only mutually comprehensible with some effort. Two close Celtic languages are Irish and Scots Gaelic. When separated for a greater length of time, languages are termed cousin languages - for example Irish and Welsh. Germans and Celts seem to have had a common origin in the remaining population of Indo-Europeans coming to Temperate Europe. The two peoples were the most westerly of the migration. They maintained settlements in close proximity, in the pre-Roman period. In consequence, there was on-going interchange – with consequential effects on political and cultural development. The ancients often used strong names to impress neighbours. Tribes, whom Caesar encountered, used the general name ‘Celt’. ‘ Gaul’ may be the word ‘ceilt’, without the final ‘t’. Gerhard Herrm said that perhaps they saw themselves as “the people who came from the darkness” (ceilt – concealment). However, the warlike Celts in the Danube Basin around 1000 BC were not hiding away. Their name duly derives from the Indo-European ‘kel’, meaning ‘to strike’. The Greek writer, Pausanius, records that they used the name ‘Celtoi’ - as did ‘all other peoples’. The name ‘German’ is itself Celtic. The root gair (near), to mean ‘neighbours’, has been suggested. However the root gaé (spear), to mean ‘spear-carrier’ or ‘sharp-witted’, is stronger. The Roman word germanus (‘real’ or ‘authentic’) takes up the latter meaning. and from thence to Spain. Other groups went south into Italy or back east, through Greece, to Galatia and onwards. This last Celtic settlement lay to the south of Scythia, which is now in the Ukraine. It was from Scythia that the Celts had originally come. Historians like Strabo, the Greek, took the view that the Germans were the ‘real (or authentic) Celts’. Both the origins and the Germanic-Celtic interrelations of early northern European tribes, such as the Celtic Cotoni, are unclear. At the Battle of Aqua Sextiae, the Romans and their Celtic Ligurian allies were ranged against the Cimbri, Ambrones and Teutones. These latter tribes came from Jutland, not Gaul, and have been regarded as Germanic. The name of the Cimbri is related to the Brythonic cymri (‘companions’) from which the name ‘Cymru’ derives. The name of their king is also indisputably Celtic. He was called Boiorix – ‘King of the Boii’ (a tribe of cattle-herders, which gave its name to Bohemia). Plutarch describes how, in Celtic style, the Ligurians heard the Ambrones rallying each other, by calling out their individual and clan names, during the fighting. The Ligurians then followed suit “for the Ligurians are known after their origins as Ambrones”. Linking with the Teutones, ‘Teutates’ was the Celtic god of the Northern Reaches. These Celtic tribes were either mistaken for early Germans or were indeed linguistically close to them. They were hardly utter strangers to the rest of their northern neighbours: a satisfactory degree of mutual comprehension probably existed through dialect continua. Tacitus’ description of Celtic physical traits is similar to some descriptions of Germans: nobody can now confirm whether he thought that they were different. The confusion in classical texts reflects the final stages of differentiation between Celts and Germans. Celtic adventurers continued to venture from their settlements, new and old, in Scythia, Spain and central Europe. From 500 BC to 500 AD, various groups reached Ireland, where they mixed with the existing population of Norse, Basque and North African origins. They called themselves the Gael. In Mayo, the Irish word for a rock stack in the ocean is ‘spinc’. One may imagine the voyagers of long ago, telling stories of their homeland and of the awesome Sphinx. The Gael built a new civilisation, which extended to Scotland and the Isle of Man. The territory was called the Gaeltacht - the Realm of the Gael. This is a mediaeval term like Frankreich - the Realm of the Franks. The Gael formed a society in which highly qualified judges, poets and bards maintained legal, cultural and linguistic cohesion. body of civil, criminal and military law. It outlined five main classes of people, together with their rights, duties and privileges. It was possibly through contact with their historic homeland in central Europe that the Gael imported the Germanic legal practice of imposing fines for crimes of personal injury. The old connections between the Celtic and Germanic peoples are still a race memory, set out in Irish mythology and celebrated at festival time in Germany. The forces of history sundered the Gaeltacht, as the golden age of its civilization reached its zenith. This brought to a virtual end one of the great European cultures of the Middle Ages, with its refined outlook and scholarship. Procuring arms in a country without a steel industry was always difficult. Soldiers often went to battle unarmed, hoping to prise weapons from the invader. The Celtic trait of choosing personal honour and glory, over coordinated military strategy, told against the bravery of the Gaelic armies. Connections with continental Europe faltered, as the Gaelic Order was dismantled in the 1600-1700s, although it has been said that the kings of Munster continued to visit the mainland later than their northern counterparts. Herodotus wrote that Celtic people, including the Druids, migrated directly from the Danube basin to Gaul, from which a journey to the British Isles would have been a logical next step. The Druids were an ancient caste, said to have derived their philosophies from Pythagoras (c500 BC). Druidic training took twenty years. Memory, not the written word, was used in schools. Written knowledge could have been lost during migration. Important subjects included the influence of the gods, astronomy (they did not postulate a ‘flat-earth’) and moral philosophy. 2) From a Settlement in Hispania Míl, or Miles Hispaniae (the Soldier of Spain), is said by Macalister (RAS, Ancient Ireland, London, 1935) to have invaded from the sea c500 BC. His wife was called Scota, indicating her people originally came from Scythia. Migrations from there to Spain undoubtedly occurred both via the sea and overland, possibly through Turkmen territories. The Irish word turcach means ‘a rough character’. The Coming of Lugh the Il-Dana, 1979. By which route did those Celts come, who had most influence on Ireland’s culture? To come to Ireland by sea via Hispania, in the first option, would have required less resources. However, it was not a method for any great numbers. Names and place-names of Gaelic relevance persist across Temperate Europe. This indicates that the route to Ireland from Germania, through Gallia, was the most important. There are also relevant mythological tales. Oskar is a common German personal name. 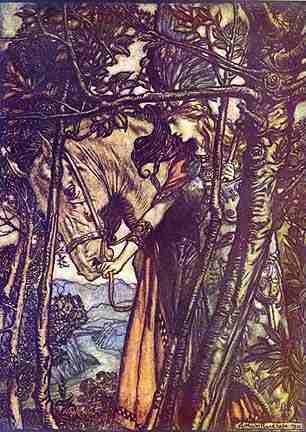 Oscar was the grandson of Fionn Mac Cumhail, one of the great warriors of Gaelic mythology. Fionn’s name is embedded in Wien. [Ösgur is also a Turkish name.] Lyons (formerly Lugdunum) was named after Lugh, God of Skills. Bregenz (formerly Brigantium) was the capital of a tribe which culted Brigid, Mother of the three Gods of Craftsmanship. She is linked to place-names from Portugal to the Ukraine. Brigid is still a popular personal name in many languages. Art is a man’s name both in Irish and German. ‘Rhein’, or ‘Rih’ in Schwytzert ütsch ( Baden), means the ‘flowing’ (rith). That other great river, the ‘Donau’ means the ‘deep/dark river’ (domhain-abha). And ‘die Alpen’ means the ‘high mountains’ (ailp). 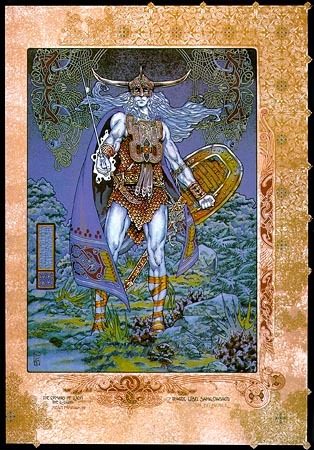 There is the myth of Nuada, King and Champion of the Tuatha Dé Danann, in an epic battle with Streng of the Fir Bolg. The word ‘streng’ is pure Germanic and means ‘the disciplined [champion]’. 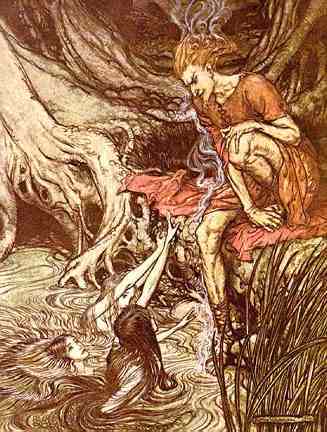 The Fir Bolg were a sub-set of the Belgae, perhaps ultimately of Norse descent. Bulga was the God of Lightning. The Tuatha Dé Danann were the people of Danu, Mother of the Gods. The saga of the Táin Bó Froích (the Cattle Raid of Froích) describes how a hero goes on expedition to the Alps to recover his stolen wife and stolen cattle. There, he meets the Lombards (Long-Beards – Lang-Bärte). There is also the tale of Labraid Loingsech (Labraid the Mariner), forebear of the Leinstermen, in his bid to overthrow Cobhthach Coel. In one version, Labraid receives help from the Franks and, returning to Wexford, he overcomes Cobthach, in 307 BC. Although very colourful leaders came from Hispania, as under the second option above, and all the kings of Ireland claimed descent from them, the mythology does not provide much information on the country itself. Gallicia housed a community of modest reach, which was well positioned as a port-of-call for Mediterranean traders bound northwards. Migration from Celtic Hispania is unlikely to have been extensive enough to dominate Irish cultural identity. The third option, the direct route from Scythia, is not a route for large or continual migrations to occur. The mythology, in recounting this minor but difficult migration, underscores the importance to the Celts of both their origins and cultural mind-set. There is no real information on Celtic and Germanic languages spoken during Roman times. In line with the accounts of migration and of the place-names quoted, linguistic evidence indicates that Irish derives from an early Celtic dialect, which was probably mutually comprehensible with Proto-German, before differentiation into two subgroups was completed. It is to be recognized that a straightforward pattern of differentiation between Celtic and German did not occur. Both languages possess grammatical forms and vocabularies, which indicate that there must still have been substantial links even two thousand years ago. These links are further examined in Paper IV. Again, it may be inferred that the route to Hibernia from Germania, through Gallia, was the most important. Some examples both of modern Celtic languages - Gaelic (Irish and Scots), Welsh and Breton - and of German will demonstrate that considerable linguistic divergence has occurred. The following are translations of: "I see her. My brother saw you." Irish Gaelic: Feicim í. Chonaic mo dheartháir/bhráthair thú. Scots Gaelic: Faic mi i. Chunnaic mo bhràthair thù. Welsh: Rwyf yn gweld hi. Gwelodd fy mrawd ti. Breton: Me he gwel. Va breur az' kwelas. German: Ich sehe ihr. Mein Bruder hat Ihnen gesehen. Scots prefer another idiom for the first sentence, saying “tha mi ga faicinn”. Irish Gaelic also has this structure: “tá mé á [ag a] feiceáil” - literally “I am at her seeing”. It might be asked if any real links, in fact, do persist between Gaelic and the other languages. The answer is yes, most certainly, but they need to be specially demonstrated. Irish is a pure language and the best-preserved dialect of ancient Celtic. The Celts were numerous and widespread. Irish is an important reservoir of Indo-European linguistic and wider cultural features. Irish and German are synthetic, inflecting languages. Maintenance of good grammar is important in both cultures. This may have had more to do with keeping linguistic nuances distinct than some undefined linguistic conservatism, often suggested. The use of correct Gaelic, throughout the Gaeltacht, was a matter of considerable effort and pride. Both languages have article-noun-adjective declensions. Irish uses five cases and German four. This is because the Vocative case is inflected in Irish but not in German. Indo-European had up to eight cases. German uses the three genders (m, f, and n). Modern Irish has dropped the neuter gender used in Old Irish. Irish and German conjugate verbs in Past, Present, Future and Conditional Tenses in the Active Voice. Both languages have a Present and Past Tense in the Subjunctive Mood. Both languages use auxiliary verbs. Both use the Infinitive as a verbal noun. German, unlike Irish, has kept the Passive Voice: “der Reiter ist vom Dichter beobachtet worden” means: “the horseman was observed by the poet”. Both languages can express the Passive Voice, however, using special constructions in the Active Voice. Vowel sounds in both languages, as is noted in Ireland, are pure rather than diphthongal. In Gaelic, vowels can be long (lá) or short (sa). In German, long (loben), half long (militär), and short (kalt) vowels have been described. However, only long and short vowels tend to be distinguished in today’s German grammars. Pronunciation of written Irish and German are in many ways comparable, with eg the ‘ch’ sound being identical. Irish puts a helping or epenthetic vowel between consonant pairs, usually where one of the consonants is l, r or n. ‘Dorcha’ (dark) has a vowel sound between the ‘r’ and ‘ch’. ‘Film’, in Hiberno-English, has a vowel between the ‘l’ and the ‘m’. German syllables end in a vowel when possible - syllabication. Consonants within a word go to the next syllable, whether open (ending in h or in a vowel) or closed (ending in a consonant). Note the German - adelig/adlig (noble). The ‘e’ is written in Süddeutschland. In Irish word pairs, the words which begin with ‘s’ denote good things and those which begin with ‘d’ denote bad things. Thus: sona (happy) - dona (bad), suairc (agreeable) - duairc (cheerless), subh (f, jam) - dubh (black, malevolent. m, something of greatest evil, potato blight). The German Sonne (f, sun) and Donner (m, thunder) may represent a corresponding Indo-European characteristic. Ogham was the original, ancient form of writing in Ireland, with limited applications. The modern morphemic system of writing originated in Greece: Egyptian hieroglyphs and Phoenician symbols were modified. The Greek alphabet was then used by the Etruscans, followed by the Romans, with adaptations to express voiced plosive sounds. Roman script was used in Ireland following the arrival of Christianity. A Gaelic alphabet was also devised better to cater for phonology. Certain elements were imported from the runic (derived from ancient Greek) and Arabic alphabets. Germanic peoples adopted the runic alphabet (also called the futhork). The widely used Roman script has to a large extent now replaced the national ones.